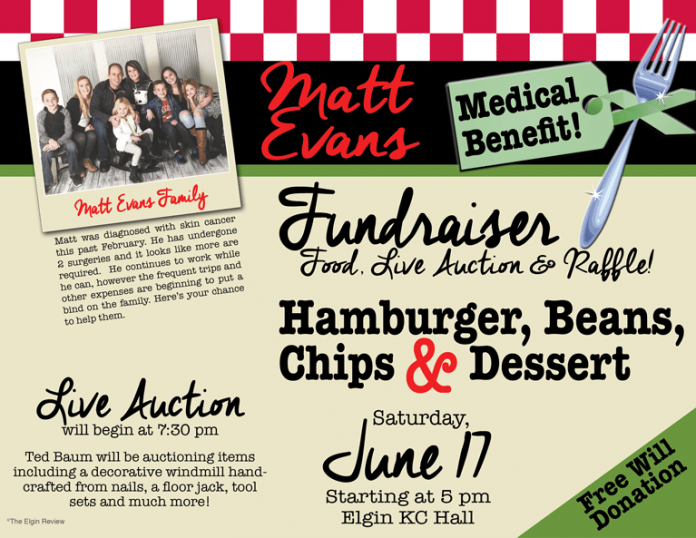 A benefit for the Matt Evans family is being planned for Saturday, June 17 at the Elgin Knights of Columbus Hall. For a donation, attendees can fill up on hamburgers, beans, chips & dessert beginning at 5 p.m. A live auction, beginning at 7:30 and a raffle will also be held that evening. Matt was diagnosed with skin cancer in February and, in spite of a couple of surgeries, his treatment appears it will have to continue a bit longer. He continues to work while he can, however the frequent trips and other expenses are putting a bind on the family..
See ya there, helping out the family!